We're hard at work researching the RV parks in the cities surrounding Mexico City. The big news here is the new toll highway connecting Mex 57D north of Mexico City with Mex 150D near Puebla. It's called the Libriamento Norte del Valle de Mexico or the Arco Norte. The route is outside the Hoy no Circula zone around Mexico City, it's a high-speed four-lane highway, and will be easy to drive in an hour and a half. For RVers this is the most exciting Mexican highway news in years. It means being able to easily drive a rig around Mexcio City with no traffic or police hassles. 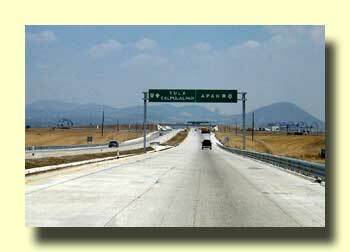 The entire project is finished and open except for about 30 miles from a point east of Tula to a point south of Pachuca. The folks at the toll stations say the rest will be open within a few moths. This seem likely - we visited both ends of the unopened section and it looks ready to us! Much more about this route in the new edition of Traveler's Guide to Mexican Camping to be available in September, 2009. It's time to head north and get down to the hard detailed work of putting all of our research down on paper. There won't be time over the next few months to write blogs or do much additional work on the Website.